Whitgreave Primary School has the safety and security benefit of CCTV cameras around the school site. The CCTV cameras are a preventative measure and have been installed to help protect the school building and assets and would be used to support West Midlands Police, should an instance arise, in a bid to deter and detect crime. 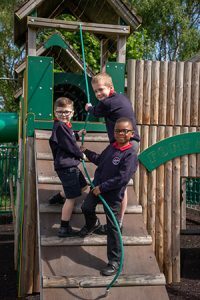 At Whitgreave Primary School the safety and security of our pupils, parents, staff and visitors is of paramount importance and the CCTV cameras support the school in their quest to maintain a safe environment for all involved. The school adheres to current legislation. Library facilities at Whitgreave Primary School are accessible to the children from designated areas around school, as well as a class library facility within classrooms. Whitgreave Primary School’s library facilities are well-stocked and provide materials for children’s research and for reading. The collection contains fiction and non-fiction books, picture books and magazines. The library areas also house encyclopaedias, atlases, dictionaries and thesauri. The aim of the library facilities at Whitgreave Primary School is to support the school curriculum through providing staff and children with appropriate resources and information. The library facilities also exist to foster a love of life-long learning outside of the confines of the curriculum and to promote and support reading for pleasure and breadth in children’s reading. 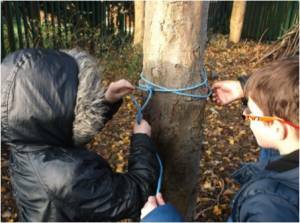 The philosophy of Forest School is to encourage and inspire pupils of any age through positive outdoor experiences over a period of time. Forest School sessions embrace the outdoors as an inspirational learning environment which focuses on the child’s learning needs rather than specific outcomes. Forest School has a unique way of building confidence, self-esteem and promoting independence as the pupils learn new life skills through hands on learning experiences. There is a development of a greater appreciation, understanding and awareness of the natural environment. 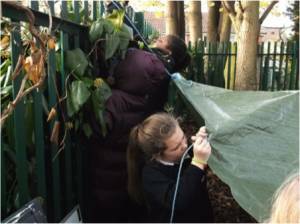 The group explore and experience the natural world on a regular basis. There is an increase frequency of physical exercise, while working in a challenging environment that helps to develop motor skills. At Whitgreave, we are extremely lucky to have a super outdoor play area, known as ‘Fort Albutt’. Fort Albutt is an exciting construction, which is bright in colour, has climbing walls and areas, rope bridges, tubular slides and secret hiding places. It is utilised at lunchtimes, whereby small groups of children are rotated on Fort Albutt, on a daily basis. Fort Albutt is also utilised for reward purposes, whereby small groups of children can work to achieve rewards and choose to spend their reward time playing on it, whilst supervised by staff members. This play area encourages our children to be active when outdoors, which in turn, supports healthy lifestyles. 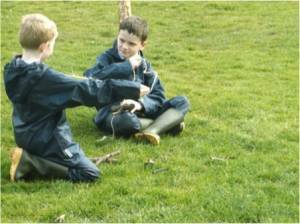 It also encourages children to work and play together, as part of a team, therefore, aiding communication and team support. Within our spacious grounds, we have a ‘Tyre Area’, whereby children can play at break and lunchtimes. 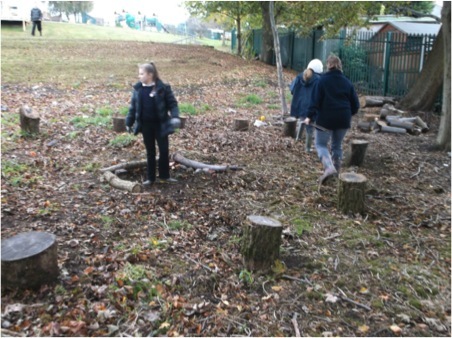 The Tyre Area again, allows for active play and team-working skills to also be developed. 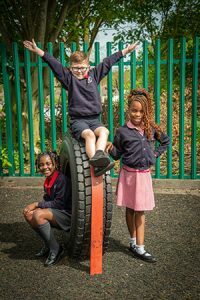 The children love to play on the tyres with their friends and have fun jumping from one tyre to another. Interactive whiteboards are effectively used by all staff as a teaching and learning tool that has the potential to transform and enrich the learning environment and the learning experience for all our children. In order to further support IT provision within school, the mobile laptop trolley allows our children access to online resources and supports learning in their own classroom, without the need to utilise the IT suite. All areas of the curriculum also benefit from the mobile laptop system and staff plan for its use within lessons. Whitgreave Primary School is also committed to allowing our children and staff the opportunity for using mobile devices (iPads) and aims to provide and use a wide range of ‘apps’ to support and enhance learning to improve motivation and engagement for all our learners. A wall-mounted projector screen and sound system in our school hall is also utilised to provide engaging school assemblies. 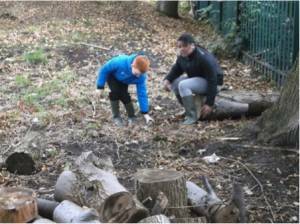 Whitgreave Primary School is well equipped to support the teaching and learning within the PE Curriculum. 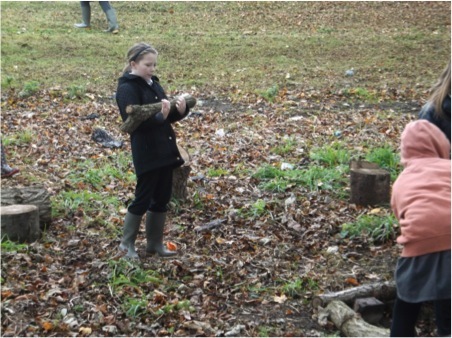 The school has a large field which is utilised to support the delivery of this curriculum area, during suitable weather conditions. The School Hall, with sound and ICT facilities, is also effectively utilised to support the teaching and learning within Gymnastics and Dance. Within the School Hall, there is a storage facility whereby the appropriate Gymnastic apparatus is stored, which staff use to deliver engaging and active lessons. The school boosts a wide range of games equipment, such as various ball types, tennis nets, badminton nets, target nets, rounder’s equipment, cricket bats, rackets, equipment to develop ABC skills, netball and basketball hoops and much, much more. All equipment is audited annually and all lost or damaged equipment is replaced. A range of PE equipment is also utilised within a number of After-School Clubs, on a termly basis.